Abraham Isaac Kook (Hebrew: אברהם יצחק הכהן קוק Abraham Yitshak ha-Kohen Kuk; 7 September 1865 – 1 September 1935) was an Orthodox rabbi, the first Ashkenazi chief rabbi of British Mandatory Palestine, the founder of Yeshiva Mercaz HaRav Kook (The Central Universal Yeshiva), a Jewish thinker, Halakhist, Kabbalist, and a renowned Torah scholar. He is known in Hebrew as הרב אברהם יצחק הכהן קוק HaRav Avraham Yitzchak HaCohen Kook, and by the acronym הראיה (HaRaAYaH), or simply as HaRav. He was one of the most celebrated and influential rabbis of the 20th century. As a child he gained a reputation of being an ilui (prodigy). He entered the Volozhin Yeshiva in 1884 at the age of 18, where he became close to the rosh yeshiva, Rabbi Naftali Zvi Yehuda Berlin (the Netziv). Although he stayed at the yeshiva for only a year and a half, the Netziv has been quoted as saying that if the Volozhin yeshiva had been founded just to educate Rav Kook, it would have been worthwhile. During his time in the yeshiva, he studied under Rabbi Eliyahu David Rabinowitz-Teomim (also known as the Aderet), the rabbi of Ponevezh (today's Panevėžys, Lithuania) and later Chief Ashkenazi Rabbi of Jerusalem. In 1886 he married Batsheva, the daughter of the Aderet. Between 1901 and 1904, he published three articles which anticipate the philosophy that he later more fully developed in the Land of Israel. Kook personally refrained from eating meat except on the Sabbath and Festivals; and a compilation of extracts from his writing, compiled by his disciple David Cohen, known as "Rav HaNazir" (or "the Nazir of Jerusalem") and titled by him "A Vision of Vegetarianism and Peace," depicts a progression, guided by Torah law, towards a vegetarian society. In 1904, Rav Kook moved to Ottoman Palestine to assume the rabbinical post in Jaffa (Yafo), which also included responsibility for the new mostly secular Zionist agricultural settlements nearby. During these years he wrote a number of works, most published posthumously, most notably a lengthy commentary on the Aggadot of Tractates Berakhot and Shabbat, titled Eyn Ayah, and a brief book on morality and spirituality, titled Mussar Avicha. Another book, a collection of his letters called Igrot Hareiyah, incorporated the acronym of his name, Abraham Isaac. It was in 1911 that Rav Kook also maintained a correspondence with the Jews of Yemen, addressing some twenty-six questions to "the honorable shepherds of God's congregation" (Heb. כבוד רועי עדת ד) and sending his letter via the known Zionist emissary, Shemuel Yavneʼeli. Their reply was later printed in a book published by Yavneʼeli. Rav Kook's influence on people in different walks of life was already noticeable, as he engaged in kiruv ("Jewish outreach"), thereby creating a greater role for Torah and Halakha in the life of the city and the nearby settlements. In 1913 Rav Kook led a delegation of rabbis, including several leading rabbinic figures such as Rabbi Yosef Chaim Sonnenfeld, to the many newly established secular "moshavot" (settlements) in Samaria and Galilee. Known as the "Journey of the Rabbis" the rabbis' goal was to strengthen Shabbat observance, Torah education, and other religious observances, with an emphasis on the giving of 'terumot and ma'asrot' (agricultural tithes) as these were farming settlements. The outbreak of the First World War caught Rav Kook in Europe, and he was forced to remain in Switzerland and London for the remainder of the war. In 1916, he became rabbi of the Spitalfields Great Synagogue (Machzike Hadath, "upholders of the law"), an immigrant Orthodox community located in Brick Lane, Spitalfields, London, living at 9 Princelet Street Spitalfields. Upon returning in 1919,:p.44 he was appointed the Ashkenazi Chief Rabbi of Jerusalem, and soon after, as first Ashkenazi Chief Rabbi of Palestine in 1921. In 1924, Rav Kook founded a yeshiva, Mercaz HaRav Kook (popularly known as "Mercaz HaRav"), in Jerusalem. Rav Kook decided to name the Yeshiva "Mercaz HaRav" to represent his vision of the Yeshiva being a place where the "Rav," or "many", could come to learn from all corners of the World. The deans (Roshei Yeshiva) following his death in 1935 included: Rabbi Yaakov Moshe Charlap, Rabbi Nosan Ra'anan, Rav Kook's son, Tzvi Yehuda Kook, Rabbi Avraham Shapira, and Rabbi Yaakov Shapira. Rav Kook was a master of Halakha in the strictest sense, while at the same time possessing an unusual openness to new ideas. This drew many religious and nonreligious people to him, but also led to widespread misunderstanding of his ideas. He wrote prolifically on both Halakha and Jewish thought, and his books and personality continued to influence many even after his death in Jerusalem in 1935, reflected in attendance of his funeral by an estimated 20,000 mourners. Rav Kook tried to build and maintain channels of communication and political alliances between the various Jewish sectors, including the secular Jewish Zionist leadership, the Religious Zionists, and more traditional non-Zionist Orthodox Jews. He believed that the modern movement to re-establish a Jewish state in the land of Israel had profound theological significance and that the Zionists were agents in a heavenly plan to bring about the messianic era. Per this ideology, the youthful, secular and even anti-religious Labor Zionist pioneers, halutzim, were a part of a grand Divine process whereby the land and people of Israel were finally being redeemed from the 2,000-year exile (galut) by all manner of Jews who sacrificed themselves for the cause of building up the physical land, as laying the groundwork for the ultimate spiritual messianic redemption of world Jewry. To the contrary, I told them explicitly that I am afraid lest there come forth, Heaven forbid, a stumbling block from their hands if they reject the Torah and the fear of G-d and 'please themselves in the brood of aliens' [i.e., studies antithetical to Torah such as Biblical Criticism]. I brought them examples of this from the past, from the incidents that took place due to people’s sins [during the Berlin Enlightenment], from which came forth groups that turned away from G-d and abandoned the source of living waters. But they must guard the holiness of Israel, teachers and students alike, and not follow foreign ideas nor turn aside from the Torah and the mitzvos. And even then, it is not from secular subjects that Torah will come forth, but rather when we support the holy yeshivas, which are dedicated solely to the holiness of the Torah. Together with this, [I told them that] they should elevate the power of the tzaddikim and Torah giants who fear G-d. And the Central Yeshiva [Mercaz HaRav] in our holy and beautiful city, which we are toiling to establish and expand with G-d’s help, will stand in its great glory. Then, upon the foundation of the holy yeshivas, I said that the verse 'From Zion will come forth Torah' will be fulfilled. These words are explicit in my speech that I spoke at that time before the people, before all of the important officials who came to the celebration, and to the entire great crowd of thousands who came from the far ends of the Holy Land and from the lands of the Diaspora. So how can malicious people come to distort the words of the living G-d in a way that is so filled with wickedness and folly?..." ...Now, two gentlemen came to me… and requested me … since they were planning to gather in the bank building here to honor the memory of Dr. Herzl and it was their finding that even those opposed to Zionism would not deny that there were in his heart thoughts concerning the betterment of Israel. Although unfortunately [Herzl] did not find the straight path, nevertheless, 'The Holy One does not withhold credit for even good talk.' It would be poor manners not to arrange a memorial in his honor in a public meeting place, such as the Anglo-Palestine Bank here. Therefore I promised them I would attend. Understandably, once I agreed to come, I did not want to refuse to speak some words. I assessed that, God willing, benefit would derive from my words, inasmuch as the other speakers would not have the audacity to belittle God, His Torah, and the sages of Israel. Thank God, this assessment proved correct. Of course, I spoke pleasantly and politely, but I did reveal the fundamental failure of their [the Zionists’] entire enterprise, namely the fact that they do not place at the top of their list of priorities the sanctity of God and His great name, which is the power that enables Israel to survive ... In my remarks, I offered no homage to Dr. Herzl per se. What I did say was that such a thought of improving the situation of Israel in Eretz Israel would be worthwhile if we would rise to the occasion. It would require return to G-d by observing and honoring the Torah, and a consensus that the foundation of all must be the power of Torah. Repenting of baseless hatred, and wholehearted peace-seeking as obligated [by Torah] would result in success because it would be close to G-d’s will. We must make amends toward the future that the power of the sanctity of Torah be at the top of our list of priorities, that "the son of Yishai lead." If the will to improve materially will rest on Torah – then God will shine His face upon us and crown our every deed with success. At first, the salvation will be gradual, as our holy Rabbis remarked upon witnessing daybreak over the valley of Arbel, but after it will gain momentum, appearing as a great and wondrous light, as in the days of our Exodus from Egypt. His empathy towards the non-religious elements aroused the suspicions of many opponents, particularly that of the traditional rabbinical establishment that had functioned from the time of Turkey's control of greater Palestine, whose paramount leader was Rabbi Yosef Chaim Sonnenfeld. However, Rav Yosef Chaim Sonnenfeld and Rav Kook deeply revered each other, which is evidenced by their respectful way of addressing each other, and the honor which they showed each other (as recorded in photos). Rav Kook remarked that he was fully capable of rejecting, but since there were enough practicing rejection, he preferred to fill the role of one who embraces. However, Rav Kook was critical of the secularists on certain occasions when they violated Halacha (Jewish law), for instance, by not observing the Sabbath or kosher laws, or ascending the Temple Mount. Rav Kook wrote rulings presenting his strong opposition to people ascending the Temple Mount, due to the Jewish Laws of impurity. He felt that Jews should wait until the coming of the Messiah, when it will be encouraged to enter the Temple Mount. However, he was very careful to express the fact that the Kotel and the Temple Mount were holy sites that belong to the Jewish people. Rav Kook also opposed the secular spirit of the Hatikvah anthem, and penned another anthem with a more religious theme entitled haEmunah. The Israeli moshav Kfar Haroeh, a settlement founded in 1933, was named after Rav Kook, "Haroah" being a Hebrew acronym for "HaRav Avraham HaCohen". His son Zvi Yehuda Kook, who was also his most prominent student, took over teaching duties at Mercaz HaRav after his death, and dedicated his life to disseminating his father's writings. Many students of Rav Kook's writings and philosophy eventually formed Hardal Religious Zionist movement which is today led by rabbis who studied under Rav Kook's son at Mercaz HaRav. 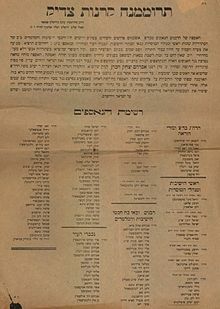 Orot HaTorah - organized and published by Rabbi Zvi Yehuda Kook, 1940. Chavosh Pe'er – on the mitzvah of tefillin. First printed in Warsaw, 1890. Eder HaYakar and Ikvei HaTzon - essays about the new generation and a philosophical understanding of God. First printed in Jaffa in 1906. Ein Ayah – commentary on Ein Yaakov the Aggadic sections of the Talmud. Printed in Jerusalem, 1995. Ma'amarei HaRe'iyah (two volumes) – collection of articles and lectures, many originally published in various periodicals. Printed in Jerusalem, 1984. Midbar Shur – sermons written by Rav Kook while serving as rabbi in Zaumel and Boisk in 1894–1896. Reish Millin – Kabbalistic discussion of the Hebrew alphabet and punctuation. Printed in London, 1917. Rabbi Gideon Weitzman, Sparks of Light: Essays on the Weekly Torah Portions Based on the Philosophy of Rav Kook, Jason Aronson. ISBN 0-7657-6080-0 ISBN 978-0765760807. Also there is now a musical project that presents Rav Kook's poetry with musical accompaniment. HA'OROT-THE LIGHTS OF RAV KOOK by Greg Wall's Later Prophets Featuring Rabbi Itzchak Marmorstein – released on Tzadik Records, April 2009. Stone carving above door where Rav Kook lived when he was the Chief Rabbi in the 1920s and 30s. Interior view of the part of Beit HaRav used for Yeshiva Mercaz HaRav as well as synagogue. ^ a b c d e also spelled Geriva: Friedman, Masha (1988). Stories From the Life of Rav Kook. Beit Shamai Publications. ISBN 0-944921-00-0. ^ "Rabbi Eliyahu David Rabinowitz-Teomim • "The Aderet"". www.hevratpinto.org. Retrieved 2018-09-12. ^ "The Hasidism of Rav Kook | The Lehrhaus". www.thelehrhaus.com. Retrieved 2018-09-12. ^ "Rabbi Abraham Isaac HaKohen Kook (1865-1935)". www.ravkooktorah.org. Retrieved 2018-09-12. ^ Fendel, Hillel. "Rav Kook, From The Pages Of The Jewish Press In 1961". ^ "BAUSK or BAUSKE". Jewish Encyclopedia (1906, public domain). ^ "The Nazir of Jerusalem". Israel National News. Retrieved 2018-09-12. ^ "A Vision of Vegetarianism and Peace". Jewish Vegetarians of North America. Archived from the original on 2016-03-05. Retrieved 2018-12-28. ^ "After serving as rabbi in the small town of Zoimel and later in the city of Boisk (Bauska), Latvia, in 1904 Rabbi Kook accepted the invitation of the port city of Jaffa ..." "Rav Kook - Orot". orot.com. ^ "1913: Rabbi Kook Leads Rabbis' Tour of the Moshavot". Israel National News. Retrieved 2018-09-12. ^ Morrison, Chanan (2006). Gold from the Land of Israel: A New Light on the Weekly Torah Portion - From the Writings of Rabbi Abraham Isaac HaKohen Kook'. Urim Publications. pp. 353–356. ISBN 965-7108-92-6. ^ "HA'OROT - Listen and Stream Free Music, Albums, New Releases, Photos, Videos". Myspace. ^ "美肌になるために". www.haorot.org. Archived from the original on 2017-12-30. Retrieved 2018-09-30.